Why Is Underlay Needed for Carpets? Underlay helps to provide your carpet with a cushioning feel when you walk on it. It not only feels better below your feet, but it also provides noise insulation much better than just carpeting alone. This is important if you are placing your carpeting in a second floor room. Additionally, in colder weather, underlay helps to provides you with insulation. If you are looking to extend the life of your carpeting, you should opt for underlay as it ensures you will not grind down your carpeting into the floor below it. 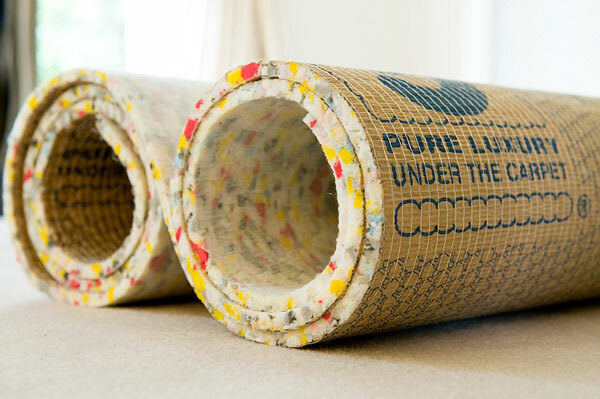 Choosing High Quality Underlay will extend the life of your carpet and make it more comfortable! Underlay can wear out just as fast if not faster than the carpet itself. If you are replacing your current carpet, you will want to inspect the condition of the current underlay to see if it needs to be replaced as well. It’s not a great solution to replace the carpet onto older underlay as it may wear down much further. We recommend buying new underlay with a new carpet to ensure that the carpet achieves the maximum life span. You should try out the underlay you choose before you end up purchasing this. It’s important to determine how the underlay feels underneath your feet, so you know what to expect. This is a great way to determine the type of underlay you require. There are three different types of underlay. These include the felt underlay which is typically one of the cheapest types available. Felt isn’t used as much as others due to its thinness in nature. Rubber underlay is durable and springy, which also allows it to be breathable. Foam underlay is one of the most popular forms of underlay available as it’s a much more cost-effective solution. It has improved immensely since its introduction which allows it to be an optimal choice for many people. If you are in the process of replacing or adding new carpets into your home, you will want to think about the type of underlay you will use. It’s best to not place any underlay underneath he carpeting as underlay provides you with a host of benefits including extending the life of your carpeting, Herts Carpets specialise in providing high quality materials and we provide very competitive quotes for Underlay Hertfordshire. When you live in an area with colder temperatures, underlay can also provide you with additional insulation against the cold. Having a softer area under the carpeting makes for a nicer walking and sitting experience, which is great for those with families, pets, and younger children. https://www.hertscarpets.com/wp-content/uploads/2018/09/JPEG300_vsmall.jpg 0 0 hertscarpets https://www.hertscarpets.com/wp-content/uploads/2018/09/JPEG300_vsmall.jpg hertscarpets2016-06-13 14:54:152017-08-27 10:57:13Why Is Underlay Needed for Carpets?